Many folks make a New Year resolution to declutter their homes, especially in the aftermath of Christmas. Professional organizer Marnie Kurylo shares her top five tips for cutting through the clutter. - Start somewhere. Start in one area (room, desk, shelf or drawer), in the part of the house you use the most, such as the living room or kitchen. Give yourself a set amount of time, be it one hour or 5 minutes. You may be surprised at how much you accomplish! - Sort first, store later. Wait on purchasing storage containers until after you&apos;ve decluttered. You may not need as much storage space once you&apos;ve sorted through everything, or you may find a different solution might work better for you. You can minimize frustration and get better results if you figure out what you will actually need to store first. "Containerizing" is the last step not the first. Plus, you&apos;ll save money. - Sort through everything, and try to make it fun. Take the time to sort through everything. Put items into categories: keep, donate, sell or toss/recycle. Whether you&apos;re sorting paper/stationary, books, toys, or clothing, group like items together (party toothpicks & napkins) to make it easier to access them in the future. Involve your kids & partner if you have them. Put on happy music, start a race to collect recycling, make it fun! - Schedule the time to follow through. Schedule a time to drop off donations & get them out of your space; take recycling to the curb or depot; take garbage bags to the bins! You&apos;ve decided to let these things go one way or another, follow through & enjoy the extra space! - Prevent clutter before it starts. 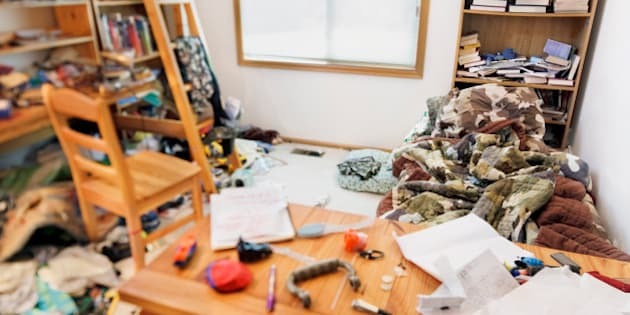 Declutter before it comes into your home! Even if it&apos;s free or a really great price, if it will just end up clutter, don&apos;t bring it home. Marnie says "Every little bit of decluttering helps. Remember, the clutter didn&apos;t come all at once, it can go a little at a time."